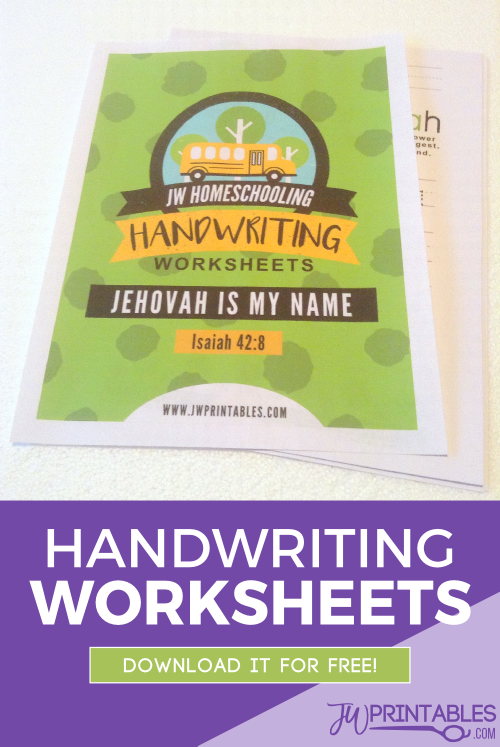 All you Homeschooling Moms and Dads out there; today’s printable is for you! Growing up, my sister and I were home-schooled by our mom. It was awesome! Not only was learning fun & engaging because we weren’t sitting in a stuffy classroom, but we also always incorporated Jehovah & his Word the Bible into our lessons. While my sister and I did attend some public schooling, homeschooling is what enabled me and my sister both to graduate early and pioneer together. Your website is incredible! I recently found you on Instagram and immediately started following your page. … it takes a very creative mind to do what you all do, so I’m sure you all can create something awesome…. We pray for Jehovah’s continued blessings as you give of yourself to help others. Of course, since we home-schooled ourselves we had to tackle this! 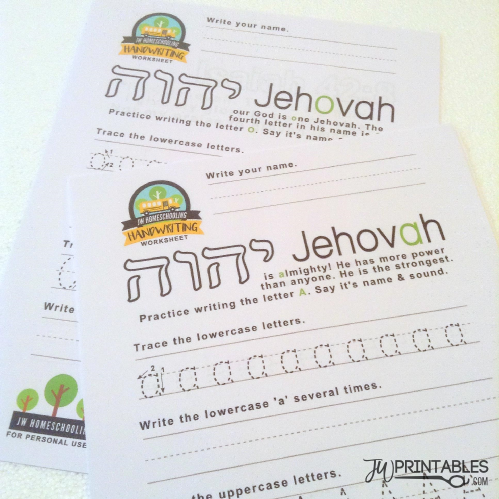 So today we are giving away a lovely printable worksheet set all about Jehovah for those who home-school their children and are looking for a little extra. homeschool category on our website, so check back often! 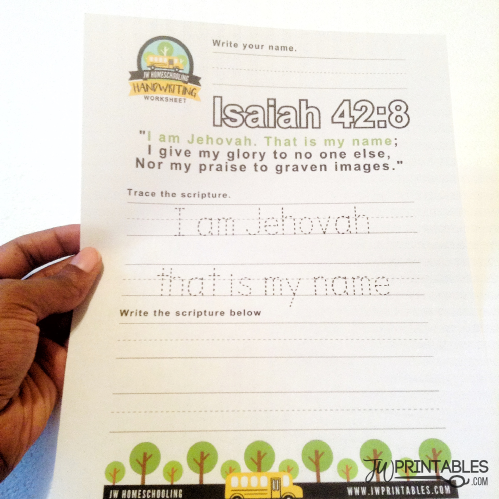 These worksheets teach your child to spell Jehovah’s name one letter a time. You can also use it a topic for discussion to include theocratic elements in your child’s school curriculum. There’s lots more but don’t take our word for it -download it to see what’s inside! 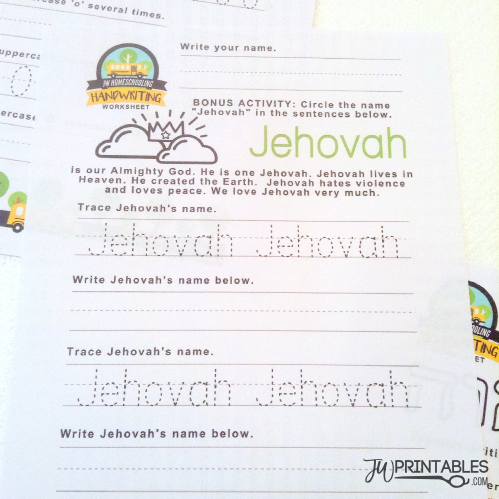 Another wonderful, creative printable. We are teaching our children Spanish as well as English and I am always searching the web for ideas. Thank you! Did you try double clicking. I noticed if I only press it once, it shows an icon. I have to click it twice. Hope that helps. I can’t thank you all enough! My oldest (kindergarten) just started this past fall, we will have 2 others close behind I will be homeschooling also, this is such a great addtition to my curriculum! I can’t speak more highly of all the hard self sacrificing work you all do to assist families staying strong during these last days! Again thank you all so so much!!! I love these. I need something similar to teach my older kids cursive! This is great!! I am homeschooling my three kids and this will come on hand!! Thanks a lot and please, keep posting ideas for us JW parents that do homeschool!! I LOVE these! 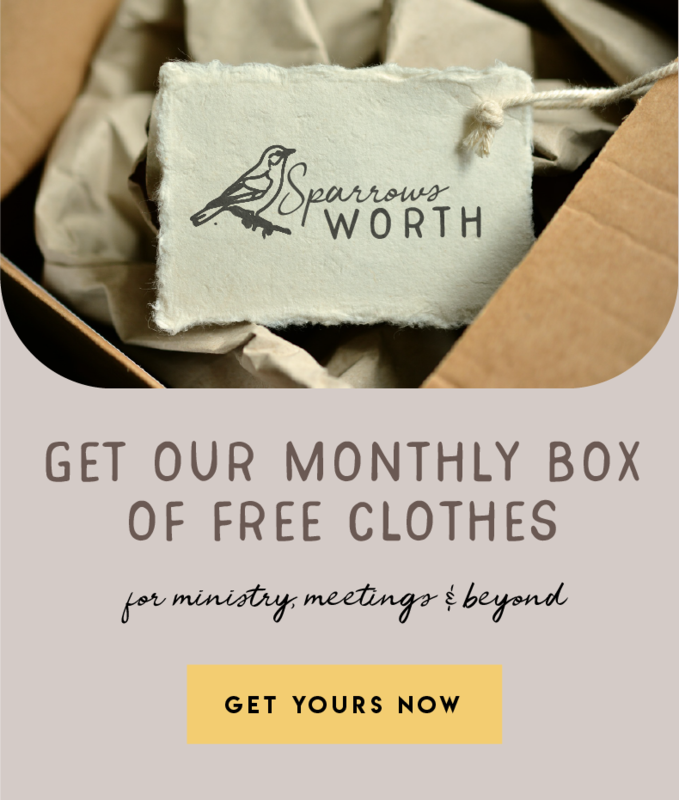 We’re planning to homeschool my little one, and there are so few resources out there specifically for Witnesses. So PLEASE keep them coming! Just a note regarding Rowina’s comment – I think she may be using Pinterest as a browser. As you said previously, a different browser would solve the problem, but also if you click on the red P button that appears, the download will start. Just in case that helps anyone else. You know you’re worshiping the True God JEHOVAH when you find the gems in the Bible but also to find people like JWprintables, you’ll never find anything like it and like them with an amazing creatived talent, mind and a heart of gold to share for free. And I have not download anything yet. I also don’t have FB or instagram, I closed all social media when i found Jehovah so I can stop the drama and problems that it was causing. But spending money on this is going to be worth it and I’m sure my 6 year old daughter that I homeschool will love it 🙂 Thank YOU so much for the sacrifice your doing!!! Lots of agape sending your way from Cornelius, SC. As a new Homeschooling mother and pioneer. I greatly appreciate your sacrifice and generosity. These activities have completely changed how we can prepare for meeting and have the kids involved and paying attention. May Jehovah continue to bless your giving spirit. This is wonderful! I’m homeschooling my two children. My daughter is in kindergarten and my son is in second grade. I am a single Mama and I know this is unrelated but can any of you homeschooling guardians please tell me how you get your children to respect you and do their work! I have tried everything and I am at my wit’s end! I refuse to send my babies to school in these last days because this wicked world is out of control! Please help! Thank y’all! Like I said…just a thought…I hope you’ve found some ideas since November to help you survive! GRACIAS por tanto timepo invertido en generar recursos espirituales… mas alla de lo indispensable. descargué esta ficha, y me parece q no esta en español?